I made this Santa Christmas cake to give to my boss for Christmas. I started by making a red velvet cake batter which included buttermilk to keep the cake moist. I baked three 20cm layers. Once cool I stacked the cake with cream cheese butter icing which I flavored with vanilla extract. I also covered the whole cake with the cream cheese icing and used a knife to create a snowy affect. I made the Smiling Santa face out of fondant. I added gel color to the fondant to make skin color for the face and ear, pink for the nose, red for the hat, black for the eyes and I used un-colored white fondant for the hat trim, beard, eye brows and mustache. To make the face, cut out a circle from the skin colored fondant and mark the eyes and mouth with a ball tool. Cut out a triangle shape from red for the hat and add white trim and ball. Make the nose from a ball shape out of pink fondant. Add two black balls for eyes. Make an ear shape from skin color fondant and add to side of face. The mustache and beard are added and the face is finished off with eyebrows and pink cheeks using petal powder and a paintbrush. I made a few green holly leaves with red berries out of fondant and trimmed the bottom of the cake with a candy cane affect which I made from rolling strips of red and white fondant together. 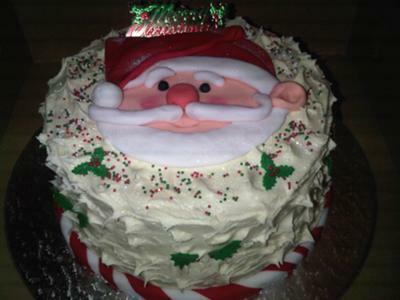 The finishing touch to the cake was topping it with the smiling Santa face and adding a sprinkle of edible glitter. This Santa is so sweet looking Great job. Realy realy nice,great job!kudos ! The cake is just superb. Love this cake. Super job. It looks beautiful and I really like that the fondant is used to accentuate the cake, not totally cover the cake. Wow! I love this cake! One of your best I think.